Modern architecture has its fans, and its critics. 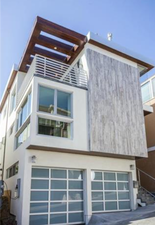 Here in Manhattan Beach, the simplicity of a modern can be a perfect fit when ocean views are part of the deal. Take the edges off a typical glass/steel/concrete house with some warm, woodsy accents, and you can have a crowd-pleasing favorite. Offered for $6.399M, this one might be out of reach for most buyers, but it's not hard to appreciate. The completely open top floor maximizes views. Floor-to-ceiling sliding glass doors tuck out of the way to create a nice indoor/outdoor space with views of the pier. High ceilings throughout and a sharp simplicity to the design give the home lots of light – and class. Much further north in town, just above Highland Ave. in El Porto, a more affordable option has been out there for most of this year. At 312 44th, the sellers recently made a deal, and if they come near their $2.200M list price, they'll do well. The 4br unit is spacious for the type of home and gets commanding ocean views over the rooftops of El Porto below. The current owners put in some built-in seating and a firepit to complete the home and better integrate the indoors and outdoors. Finally, there's a newly built home in the midtown area at 221 23rd Place. This one goes more in the stark direction, with something of an art-gallery air and some very custom touches. But it's new, in a prime location and with good views from its main living spaces, and even more views between houses where strategically placed windows focus on the blue where it can be found. This one came out asking $2.999M and seemed to draw immediate interest. They're officially in escrow now after about 6 weeks.